It always makes me a little bit sad to read interviews where chefs explain that they can go days without eating a proper meal. I suppose it comes with the territory of working such strange hours and constantly tasting, testing and tweaking, but it does seem a shame to be surrounded by so much wonderful food and not have the opportunity to sit down and properly enjoy it. In between school and university I spent six months abroad, working as a waitress beforehand to save money for my trip. Sixty-odd hour weeks and lots of late night shifts meant complete disruption of my body clock, compounded by the fact that the restaurant I worked in refused to serve their staff proper meals in between shifts (a practice completely counter-intuitive unless you want your waitresses wandering round ravenously eyeing up plates of food as they emerge from the kitchen). Sometimes the chefs would take pity on us and one of the very best perks was when a batch of homemade ice cream was coming to an end. Mid-afternoon, once the lunch rush was over, they’d blend the ice cream with bananas and milk, turning it into the most incredibly rich milkshake which was then shared around in an assortment of mismatched vessels and gulped down as we hung round the kitchen and gossiped. A second edible perk was a little more illicit, and perhaps even more enjoyable for being so. In between lunch and dinner service, local mums would come in for coffee so we always had a small selection of biscuits and cakes on the counter. Each week the treats would change bar a loaf of banana bread which never went off the menu, famed with customers for its moist richness, chocolaty chunks and golden brown banana-y goodness. At three pounds a slice, I don’t imagine my manager would ever have dreamed of offering us waitresses any but sometimes, if no one else was around, it was possible to sneak just the smallest of slivers, carefully replacing the glass dome under which it sat and tucking it into your apron pocket. A quick trip to the cellar to ‘stock take’ and a few moments of sweet, energy-filled fuel would be yours, any evidence brushed away in a scattering of crumbs as you emerged upstairs to work the rest of a shift. Nowadays, working normal office hours means I tend to know where my next meal is coming from. But I still have a weakness for banana bread. It’s one of those recipes that’s hard to get wrong – given the right ratio of banana to any kind of fat, sugar and sweetness, a few extras in the form of fruit, nuts or chocolate and you’re onto a pretty good thing. The recipe below is a little more virtuous than the chocolate-packed loaf of my waitressing days, but no less delicious for it. With half a bottle of maple syrup left over from making this granola, I decided to use syrup as my sweetener, mixing it with olive oil instead of butter, a little yoghurt for moisture and a generous handful of walnuts and cocoa nibs for added crunch. The result is a rich, moist, everyday sort of banana bread, the middle soft and light and the crust every so slightly caramelized and crunchy. It’s amazing eaten warm, thickly spread with peanut butter, or allowed to cool and served with a dollop of yoghurt and a spoon of fruit compote. I imagine it’s also delicious eaten in sneaky slivers out of an old apron pocket, although this particular loaf hasn’t made it any further than the top of my kitchen counter. One slice is never enough . . .
Preheat the oven to 170 degrees C. Oil a 21cm long loaf tin and line the bottom with baking parchment. In a medium bowl, mash the banana. A few little lumps are fine and will add texture to the loaf. Add the yoghurt and mash again to combine. In a separate bowl, whisk together the eggs, maple syrup and olive oil until thoroughly combined. Add the banana mixture and whisk again to incorporate. Sift the flour and baking powder into the wet mixture and fold carefully to combine. Add the walnuts and two thirds of the cocoa nibs and fold again until just combined. Pour the mixture into the prepared loaf tin, sprinkle with the remaining cocoa nibs and bake for 50 minutes to one hour – the loaf is done when golden and risen on top and a skewer inserted in the middle comes out clean. Remove from the oven and leave to cool in the tin for five minutes before turning onto a wire rack to cool completely. Serve in thick slices as it is, with a dollop of greek yoghurt or – my favourite – spread thickly with natural peanut butter. What a lovely story. Great idea to add the cocoa nibs, both for flavour and texture. Ooh, I have some cocoa nibs to use up – I might try this! Your waitressing experience sounds very familiar, mine was pretty much the same (minus the banana bread, and replace the milkshakes with chips). I always think it’s absurd that most office workers have an hour lunch break as standard, but I don’t think I ever had a single break as a waitress, let alone any time in which to eat – even during a 9-hour shift. I love that banana bread is so adaptable and very forgiving when it comes to not having quite the right ingredients. I really like the idea of eating it with peanut butter. Very nice picture of an excellent recipe. I remember working as a waiter during holiday time. I was hopeless at it as well as being eternally hungry. 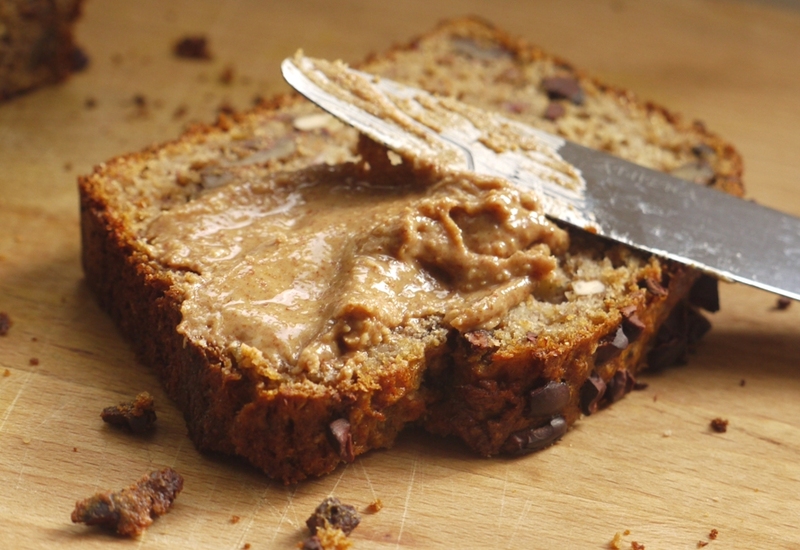 This looks wonderful…why have I never thought of spreading peanut butter on banana bread before?! Ooh this looks gorgeous. 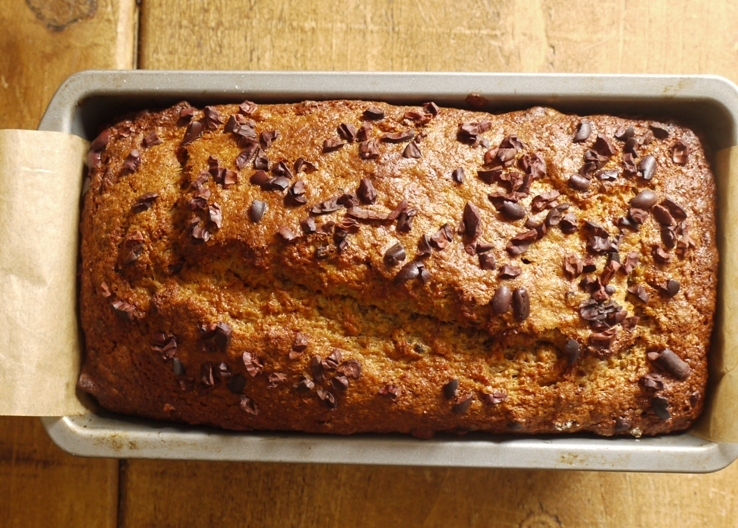 I’m a sucker for banana bread in any form and the addition of maple and cocoa nibs sounds amazing. This looks divine! I have such a weakness for Banana Bread, it is the one homebaked item I remember vividly from my childhood and the only recipe I have handed down to me. I love the addition of maple syrup in this, will have to give it a go. I wonder is honey would also work? Elly – ah yes, we used to steal chips too! It’s complete madness – the other restaurant I worked in always fed us before our shifts…so so much better! Food, Photography & France – haha, oh dear! Joy – I don’t know, it’s amazing! Sophie – the cocoa nibs add a really lovely crunch. Highly recommend. Nelly – honey would definitely work. It’s possibly slightly sweeter than maple syrup so I’d add to taste. Love your story telling… and the cake looks lovely. 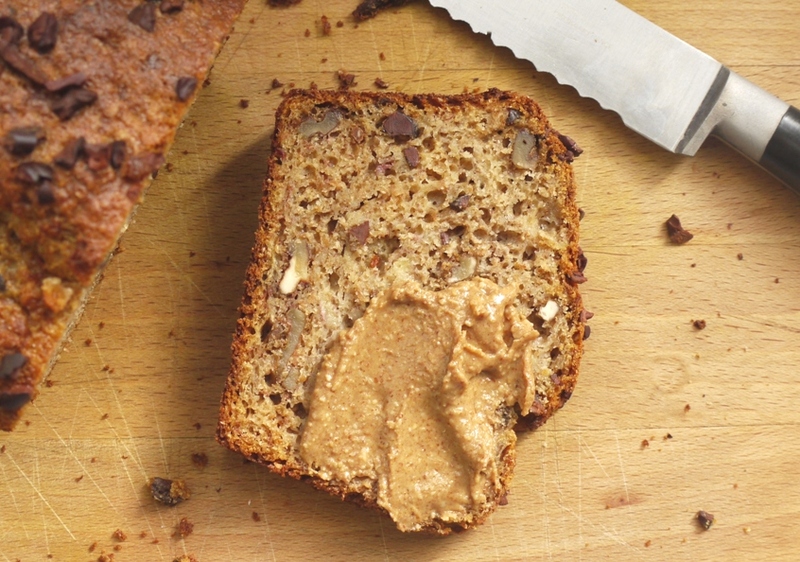 I firmly believe that banana bread and a cup of tea can you get you through anything – nb, love the idea of peanut butter on it- had never even crossed my mind (I’m a ricotta and honey girl from way back). Lauren – I know, I can’t believe nobody complained about it! Tori – ricotta and honey sounds like a pretty fab alternative. Chloe – you can buy big packs in Holland and Barrett for about £5 – so much cheaper than Hotel Chocolat which is where I was getting them before! This recipe is going on file. I love the whole grains and maple sweetener. I love banana bread! this recipes looks really indulgent! currently without my kitchen -this baby is a torturous torment indeed! Presumably the last 1/3 cacoa nibs are scattered atop? Prior to baking? Not that I have cacao nibs…but I do have blocks of cacao! Which I am happy to champion as even better and even more delicious. Worth giving that a whirl. Texture looks a beaut -will be made! Anyway…stockpiling bananas as I type -and hoping like mad cacao (Willie’s block type) will work well! That looks lovely – I’m yet to bake with cocoa nibs. oh, dear. my favorite sort of sweet loaf. I had other baking plans today but I think they might get put on hold after seeing this bread! I love the use of maple syrup as it would go so well with bananas and the addition of wonderful cacao nibs is genius. I look forward to trying this version. Yum! It looks moist and dense, just like banana bread should be. And I love the addition of maple syrup! The restaurant my brother used to work in was really good about giving everyone a proper meal before service started but the place he works in now isn’t so good. It must be a nightmare to run around without any fuel inside you! 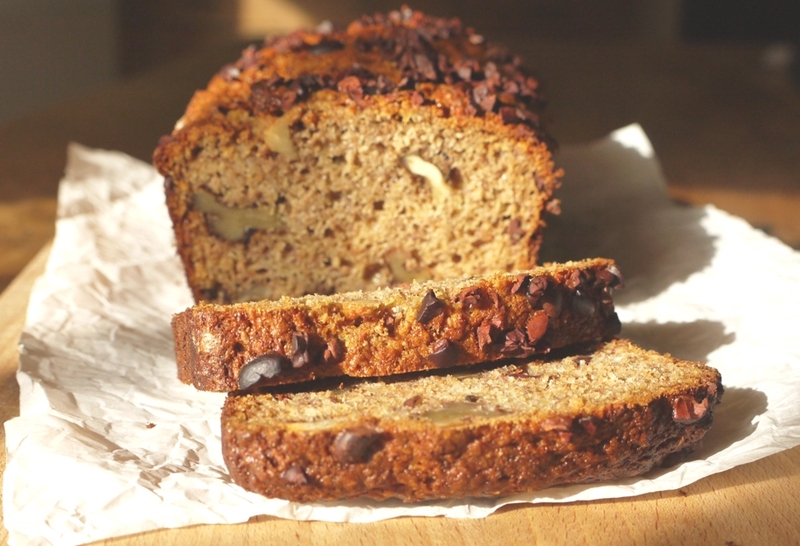 Love this take on banana bread with so many of my favourite ingredients! I worked in two restaurants at the same time. One was amazing and fed us before every shift (using incredible Italian ingredients and amazing leftovers), the other was the one I’ve mentioned, and pretty awful. I like your waitressing tales. I put roasted peanuts in banana bread more than I do walnuts, but I never slathered peanut butter on it, it´s perfect! This looks like a normal banana bread but the ingredients are superior. Gorgeous Kate! I worked at a bakery with a “snack tray.” All of the end pieces, misshapen morning buns, and broken cookies made their way to this shallow fish tub for us hungry employees to freely nibble from. And do you know what was always the best find in the snack tray? Coincidentally, the banana bread (for which this bakery was also famed). 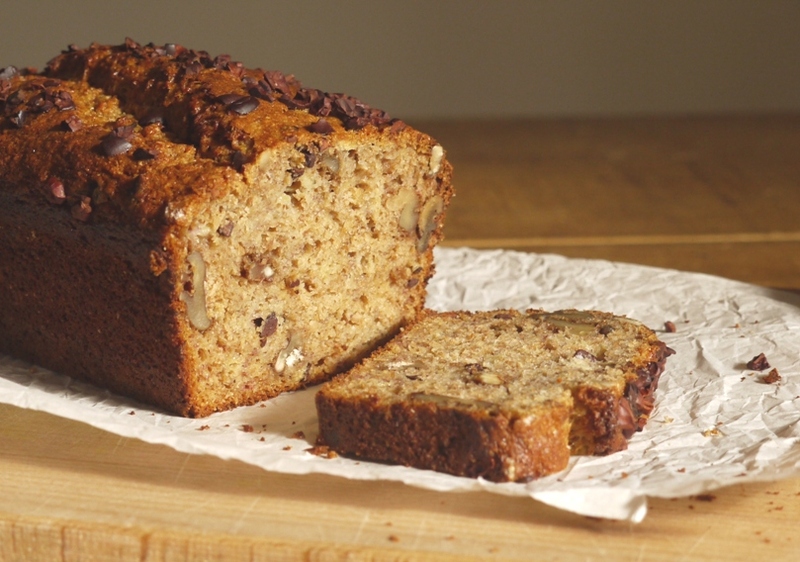 I love banana bread and all of its variations, too, but I love that this one is slightly more virtuous and breakfast-worthy! The snack tray sounds absolutely incredible! And this banana bread looks great. Love how you used cocoa nibs and maple syrup– clever. Sounds like a pretty pants place to work really. I would have taken a stand! gorgeous cake by the way – at least you came out with something good :D, other than cash. It was actually a really good and well respected restaurant – crazy that they could get away with it! Are cocoa nibs just chocolate chips? Aliborgas, Erinn – cocoa nibs (sometimes called cacao nibs) are pieces of roasted, hulled cacao beans i.e. raw chocolate. They have a strong cocoa taste but are slightly bitter and crunchy, so a little different from chocolate chips. You could substitute chocolate chips if you can’t find them, but it will taste softer and sweeter. I love a good breakfast laugh and this ticks all the right boxes – banana, maple syrup, cocoa nib, walnuts and then some peanut butter on top? Delicious photos as always! You always make your recipes sound mouthwatering! When I first started reading the post I wasn’t sure it sounded nice but you have completely convinced me! Hmmm, that looks delicious – I am very into cocoa nibs lately, so they’re a especially nice touch IMO. I just made banana bread muffins over the weekend and am kicking myself for not adding in cocoa nibs. I’m totally adding them in the next time I make banana bread. I also love that you used yogurt, maple syrup, and olive oil–great ingredients! I have a total weakness for a good loaf of banana walnut bread. Yum! I love banana bread and keep buying bananas to make it except the family eats them before I get a chance, no matter how many I buy. Finally a few weeks ago I managed to make one and it was so moist and bursting with choc chips it was gone in two days… that was the problem… probably best if they eat up the bananas… but if they don’t I am trying your recipe. Yes! I can empathize. I assist at a lot of food photography shoots where it’s considered bad form to eat the food after it’s been shot. Whole platefuls get tossed into the trash—such a waste, such a waste. We’re able to sneak a few bites here and there, but only when no one’s looking. I love how you just… innovated (for lack of a better word) this banana bread! All its elements sound perfect. Truly. Maple syrup, yum, yogurt for moistness, olive oil, cocoa nibs! Yum yum yum in my tum tum tum, as my four year old would say! I would love to try this recipe…Could you possibly give me all the quantities in imperial? Hope you like the recipe – it’s become a household favourite of ours! Where are you based? You can usually find them pretty easily online. Ok, I found nibs…do I get sweetened or unsweetened? hi if i dont use wholemeal flour how many grams do we need to substitute using the regular flour? This recipe is fairly flexible so you should be fine using the same amount of regular flour. You might need slightly less liquid with white flour though so keep an eye on the consistency. I made this exactly as shown…(although I did have to recalculate all the measurements into imperial)…I don’t know what happened, but the top sunk down when I took it out, and it was all mushy in the centre…only the edges were edible…help!!! !